A combination of brick and siding gives this economically sized home strong appeal and a fresh look. 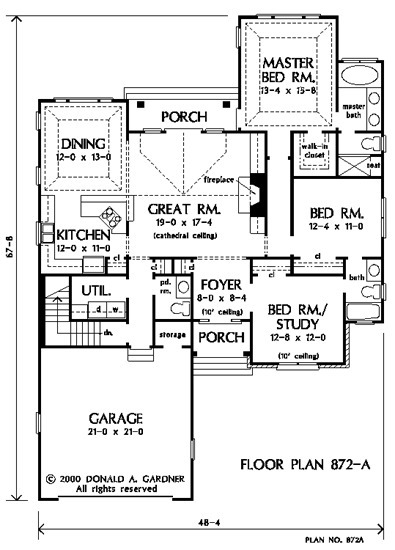 The floor plan is very functional with usable room sizes. Numerous windows have been incorporated for optimum natural light. A single eating space allows for other rooms to be larger by redistributing square footage throughout the home. This one eating area is less formal than a traditional dining room, but more so than a casual breakfast area; note the tray ceiling. Flexible space has been designed into this home in a bedroom/study. The space can be used as a bedroom, living room, den, study, home office, etc. Ten-foot ceilings add volume to the bedroom/study and foyer, while the great room is expanded by a cathedral ceiling with rear clerestory dormer. 1st Floor: 1682 Sq. 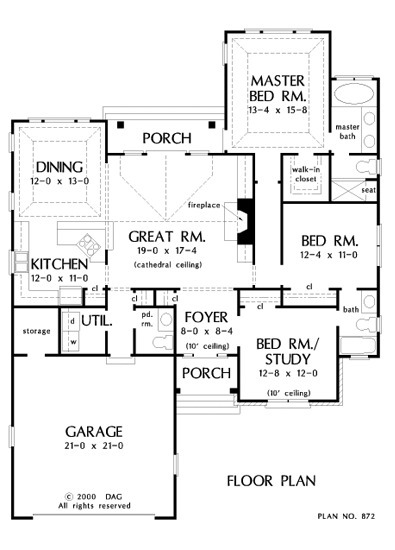 Ft.
House Dimensions: 48' 4" x 64' 0"
Great Room: 19' 0" x 17' 4"
Foyer (Flat): 8' 0" x 8' 4" x 10' 0"
Dining Room (Tray): 12' 0" x 13' 0" x 11' 0"
Great Room (Cathedral): 19' 0" x 17' 4" x 17' 9"
Kitchen : 12' 0" x 11' 0" x 9' 0"
Utility Room : 5' 10" x 6' 0" x 9' 0"
Garage Storage : 5' 10" x 6' 0" x 0' 0"
Master Bedroom (Tray): 13' 4" x 15' 8" x 11' 2"
Bedroom / Study (Flat): 12' 8" x 12' 0" x 10' 0"
Porch - Front : 8' 0" x 5' 0" x 0' 0"
Porch - Rear : 15' 4" x 4' 4" x 0' 0"